Writing is such a rich, creative practice to cultivate. Whether you are writing for yourself (keeping a travel journal, writing to reflect at the end of the day, writing personal affirmations), or writing with the intent of sharing your work publicly on your blog, in a published article, or as a book, there is tremendous value in getting the words from your brain down on the page. Just like anything you want to be good at, writing takes time and effort. 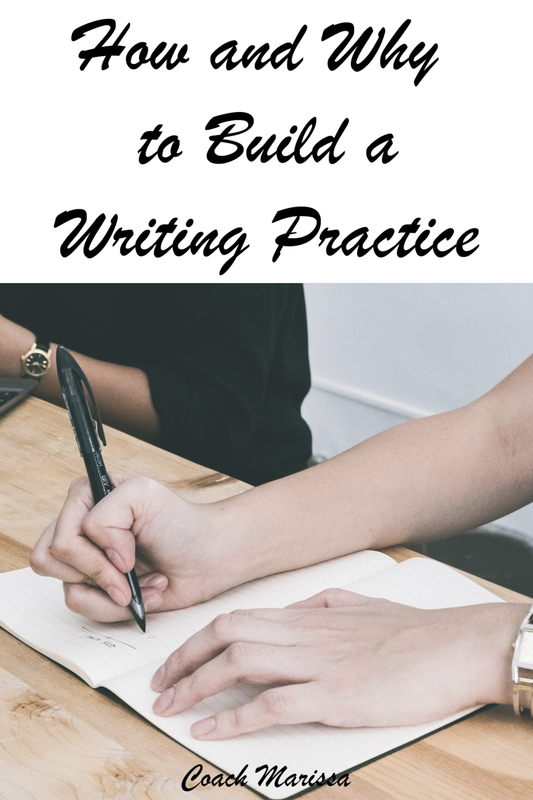 Building a regular writing practice will not only increase your productivity as a writer and make you more prolific, but it will also make you a better writer, simply because you are writing more and more often. I have alway been a casual writer, dabbling in blogging, articles, and journaling over the years. I love to write, and as you know if you feel the calling to write, it’s hard to ignore. Something deep within us feels the need to express ourselves with words, to record the world around us, or create and describe a new one. I love putting sentences together, and trying to find just the right word to articulate a feeling. The funny thing is, even with the strong calling that I feel to write, and even with the tremendous satisfaction I feel when I do actually put pen to paper (or fingers to keyboard), I often have not made time for writing. I realized that needed to change. As I set my goals for 2018, writing came up as a common theme. I wanted this year to be a more creative year, which for me means expressing myself writing. I wanted to grow my audience for my coaching, and one of the ways that I do that is through this blog. I wanted to continue on the path of self-discovery, constant learning, and growth, which goes hand in hand with journaling, taking workshops, and reading books to further my education in my interest areas. Finally, I am for the first time working on a longer piece of writing, something that I have always said I would do, but haven’t started until I recently committed to it and made it a priority. Needless to say, writing is a strong value for me, for this year and beyond, and the way I can align with that value is to build a consistent writing practice. If you are already a writer, or just feel the call to write but don’t know where to start, give the following 3 simple practices a try to strengthen your writing muscle. These three habits have already increased my writing production, regularity, and inspiration. I’m not kidding when I say daily. The more regularly you can write, the better. Even if it’s 5 days a week and not 7, that’s great to shoot for, but writing every couple of weeks or months is not enough if you want to build a writing practice and reap the creative benefits of having one. To establish when your daily writing date should be, first reflect on your own energy. When is your peak energy during the day? That is ideally your writing time. Mine is first thing in the morning, after I’ve washed my face, had breakfast and tea, and done a short yoga practice. So I write everyday from 7:30AM-8:30AM. Tap into your best energy, and try to schedule your writing time as in line with that as possible. Once you’ve established when your daily writing date should be, put it in your calendar and set a reminder! Honor that time. Treat it like an actual appointment. Try not to take appointments or meetings or do any other work during that time. If you do have to cut into that time, I encourage you to make up the hours later in the day or have a longer session the following day. This will encourage you to take it seriously and make it a priority. You don’t have to share your writing with someone to have them as an accountability partner. Establish someone that you check in with about your writing process. This could be sending a weekly email of how many words or hours you wrote, sending them a blog each time you publish one, or even sharing ideas/inspiration about writing that you are excited about it. Your accountability partner could be someone else in your life who also wants to write and you can keep each other on track, this could be a partner, friend, co-worker, or a coach. I use my own coach to help me keep on top of my creative goals, and we check in about writing every couple of weeks. An accountability partner is that extra incentive and reminder to make sure you are following through on your writing goals. This may seem simple, but if you want to write and be a good writer, read. Read as much as you can. Read about writing, but also just read good writing. Read a variety of genres, by a variety of authors, fiction and nonfiction. I even use this as a direct tie to my writing, because I write reviews on my blog about the books I read. That practice encourages me to both read and write, so it’s a win-win. Reading also inspires your own writing. You can notice how an author skillfully hooks you in with their first sentence, or how they play with different chapter lengths, metaphors, synonyms and styles and it can inspire things you want to try in your own writing. Set a reading goal for yourself. For example, I read one work-related nonfiction book per month, something typically in the coaching or wellness field, and then one choice book per month which can be fiction, memoir, biography, etc. Now . . . Start! Start today. Set your daily writing date on the calendar for tomorrow, reach out to someone who can keep you accountable, and go to the library or on Amazon and pick a few books you want to read this month. At the end of the day, the best way to write, is to sit your bum down and… you guessed it… write.